We’re all human. We’re busy, under pressure, and trying to juggle a thousand tasks while still getting out of work in time to catch our child’s music recital. So it’s understandable when mistakes happen. This report collects some of the more common mistakes we've witnessed over the years — and, more important, draws lessons that will prevent them from reoccurring. This report is not intended to be exhaustive, nor is it intended to make light of companies. These companies are not alone; each mistake is representative of a much larger sample. The reason for creating this report is to provide something that is easy to read, digest, and pass around, and to help make many teams within your organization aware of some of the more common oversights and errors. We've found that sometimes the best way to learn what your organization should do is to first learn what not to do. 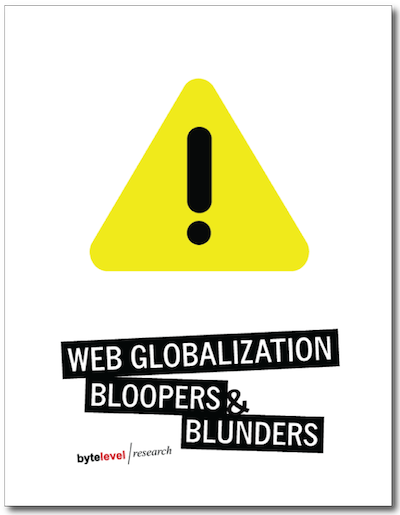 NOTE: This report is included with the purchase of the 2018 Web Globalization Report Card. John Yunker has helped a wide range of Fortune 500 companies improve their global websites and application. He has experience consulting with some of the world's largest companies and has also worked as senior program manager at Microsoft. He authored the first book devoted to the emerging field of web globalization, Beyond Borders: Web Globalization Strategies. John speaks at numerous industry events, including Localization World, Internet Retailer, and the Unicode Conference and has been quoted on global topics in publications including The Wall Street Journal and The New York Times. He is also editor of the popular web globalization blog Global by Design.